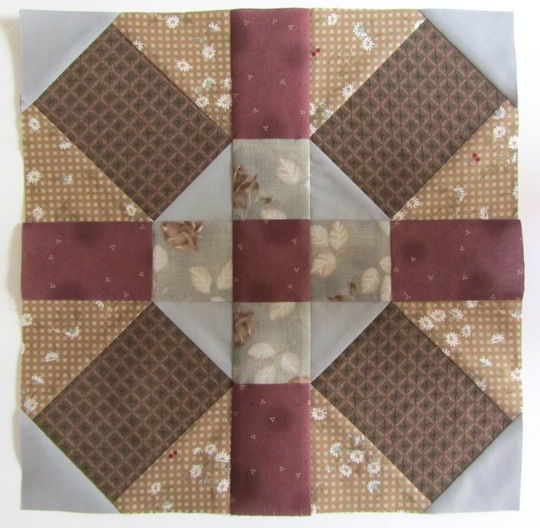 I was thrilled when Scott Hansen asked – despite my absence around here – if I would like to participate in his latest quiltalong, the Bloggers’ Bar Hop Quiltalong. Thrilled. 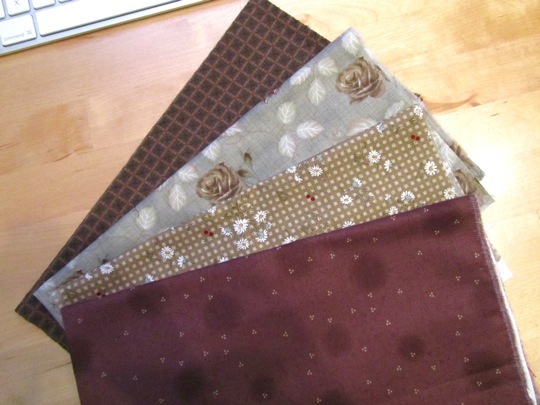 Then I received the fabrics kindly supplied by Clothworks from their European Taupe VIII collection by Kinkame. You had me at taupe, Scott. 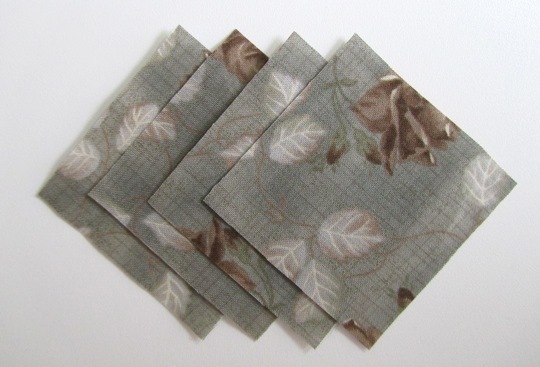 Then I began to worry that someone had been snooping in my stash and would therefore know that I have been known to have a Japanese taupe addiction (NO, this is not a situation of what fabric am I NOT addicted to…stop it). A longtime admirer of the low-contrast combinations of these fabrics, I decided to be subtle and add only a cool solid grey to make my 12″ Cross Bar block. 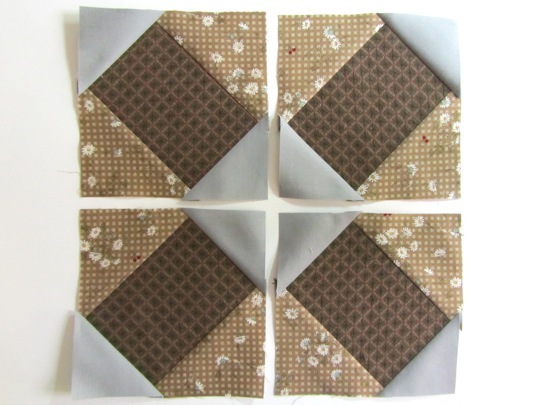 For this block, you will need five fabrics. The block finishes to 12″. All seams are 1/4″. 1. 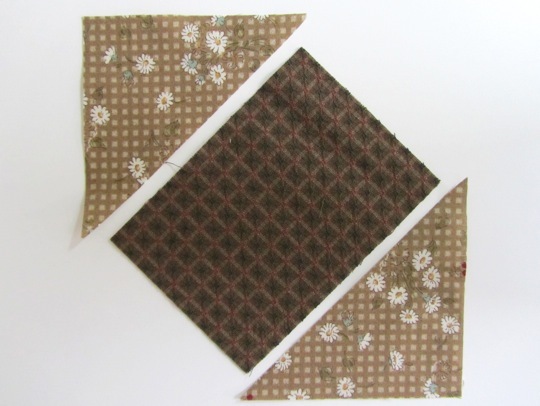 Begin by sewing 2 brown floral check triangles to both long sides of the brown plaid rectangle. 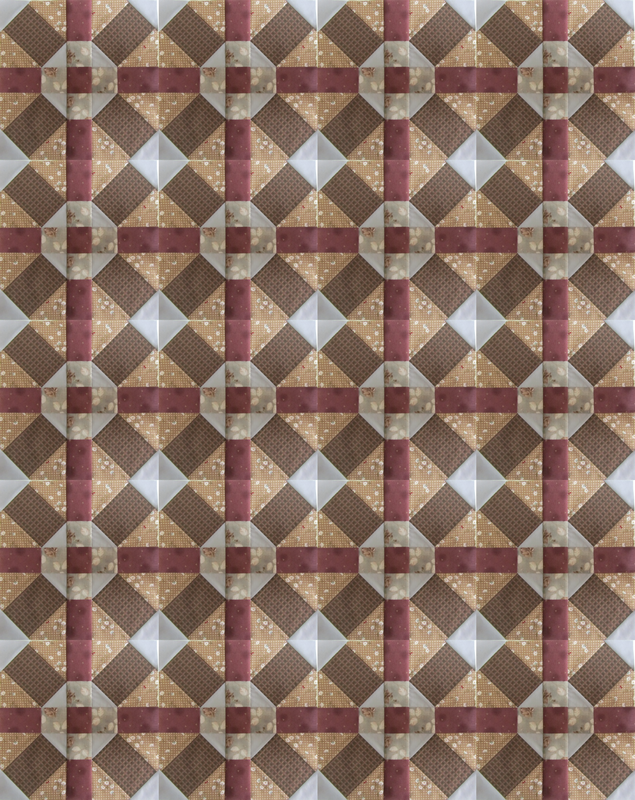 Repeat with remaining three brown plaid rectangles. 2. 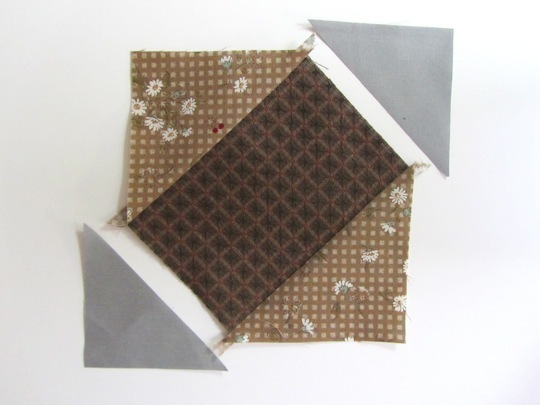 Sew solid grey triangles to the short sides of the brown plaid rectangle. Repeat with remaining three brown plaid rectangles. 3. 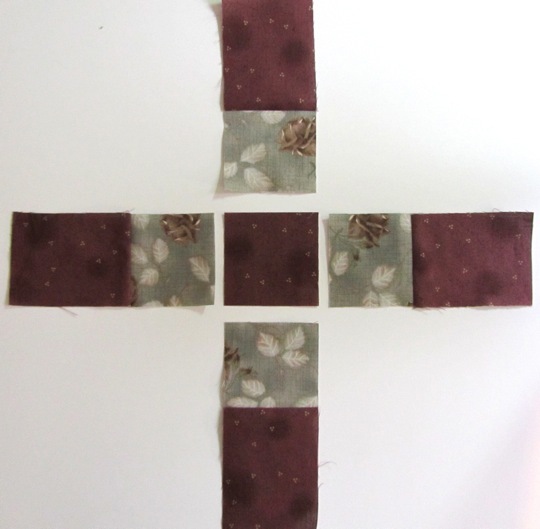 Sew burgundy tonal rectangle to grey rose square. Repeat with remaining three burgundy tonal rectangles. 4. 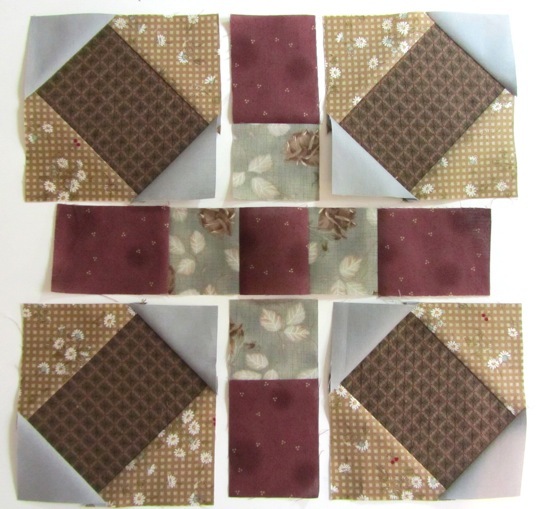 Arrange burgundy tonal/grey rose units as shown in the photo below. 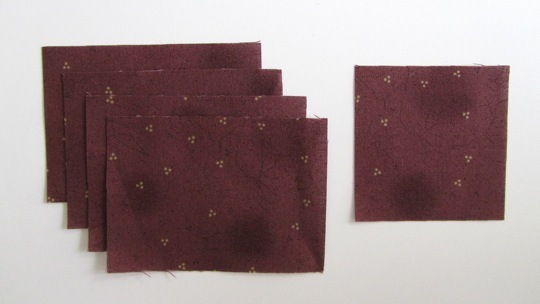 Sew burgundy tonal square between the burgundy tonal/grey rose units. 5. 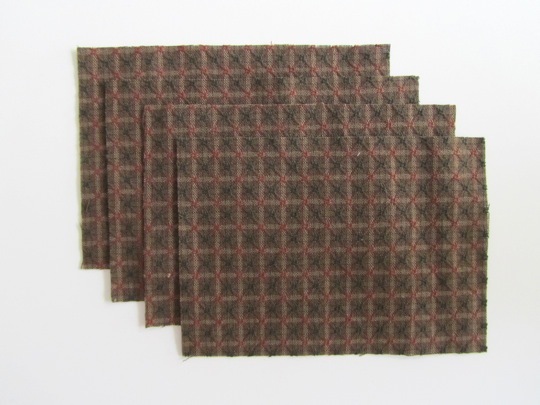 Sew brown plaid units to both sides of burgundy tonal/grey rose units as shown in the photo below. Repeat for bottom row of block. 6. 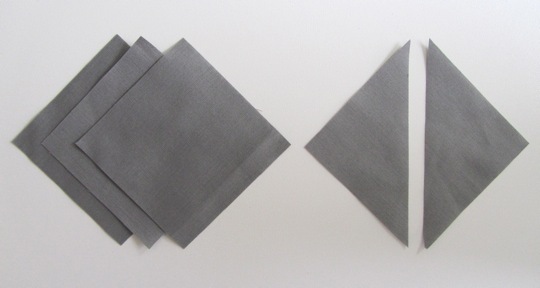 Sew block units together as shown. There you go. 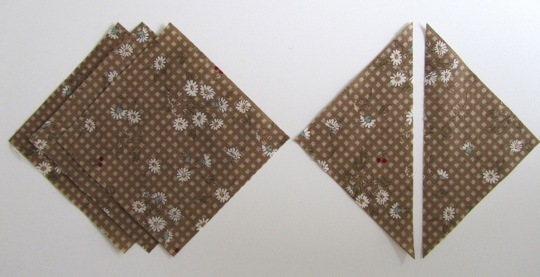 I think this would make a wonderful subtle scrappy quilt. Yes, imagine it scrappy. 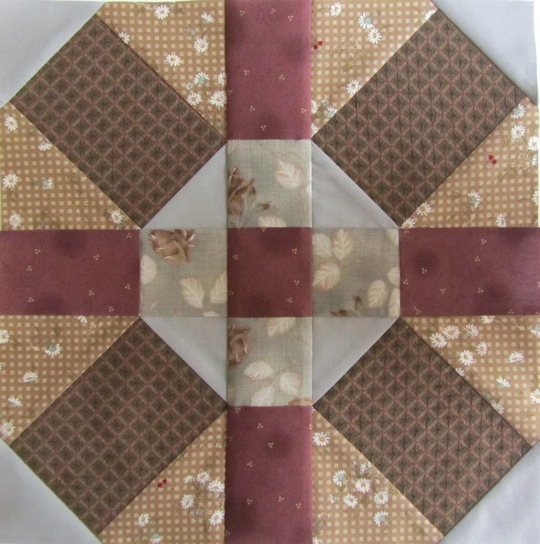 You can see blocks going up at the quiltalong Flickr group page too. Thanks for visiting and thanks, Scott, for inviting me to join in the fun!